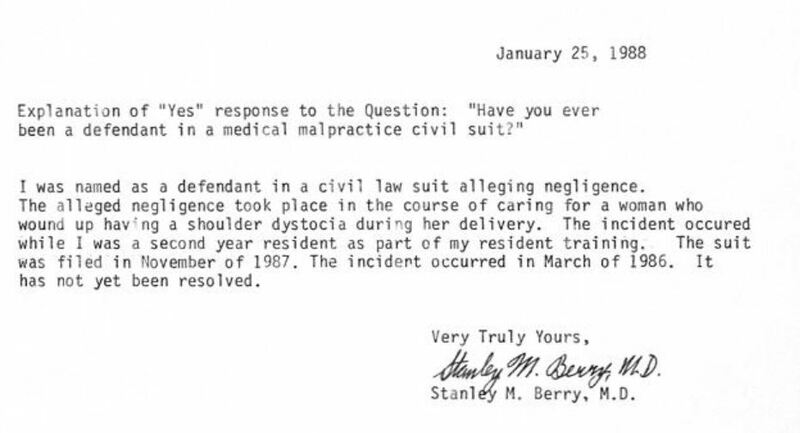 Medical license application file for Stanley Michael Berry, state of Michigan. Lawsuit ruling on abortion legislation in Michigan, Sept. 12, 2005. Stanley M. Berry, M.D. named in plaintiff list. Stanley M. Berry, M.D. listed as plaintiff in lawsuit over abortion regulations in Michigan. Berry described as responsible for abortion procedures in maternal-fetal medicine dept. at William Beaumont Hospital in Royal Oak, MI. See pages 5 and 6.